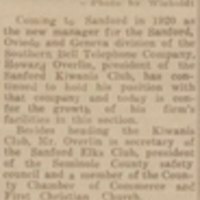 A newspaper article about Howard Overlin, the manager of the Sanford, Oviedo, and Geneva division of the Southern Bell Telephone and Telegraph Company in 1933. Overlin was born and raised in Evansville, Indiana. In 1911, he began his telecommunications career by working for the Indiana Bell Telephone Company, until he was transferred to the Illinois Bell Telephone Company in 1914. In 1918, Overlin migrated to Jacksonville, Florida, to manage the Southern Bell Telephone Company's lines in Camp Johnson during World War I. Once the war ended, he transferred to Sanford and resided at 113 West 19th Street with his wife, Maude Growe Overlin. In addition to his business career, Overlin was also president of the Sanford Kiwanis Club, secretary of the Sanford Elks Club, president of the Seminole County Safety Council, a member of the Seminole County Chamber of Commerce, and a congregant of the First Christian Church. Original newspaper article: "Howard Overlin." The Sanford Herald: Who's Who of 1933, Vol. 24, No. 157, April 29, 1933. Sanford Museum, Sanford, Florida. Digital reproduction of original newspaper: The Sanford Herald: Who's Who of 1933, Vol. 24, No. 157, April 29, 1933. Tag number DP0008186. Central Florida Memory. Digital reproduction of original newspaper article: "Howard Overlin." The Sanford Herald: Who's Who of 1933, Vol. 24, No. 157, April 29, 1933. The Sanford Herald, Who's Who of 1933, Vol. 24, No. 157, April 29, 1933, page 9. Copyright to this resource is held by The Sanford Herald and is provided here by RICHES of Central Florida for educational purposes only. The Sanford Herald, Who's Who of 1933, Vol. 24, No. 157, April 29, 1933. Central Florida Memory. http://digital.library.ucf.edu/cdm/ref/collection/CFM/id/120111. “Howard Overlin.” RICHES of Central Florida accessed April 18, 2019, https://richesmi.cah.ucf.edu/omeka/items/show/3017.